Caye Caulker has a laid-back, casual environment with great pricing and a rich night life, making it a popular destination for budget travelers and backpackers. Caye Caulker is also popular with scuba divers, snorkelers and tourists who are looking for a beach-oriented, relaxing holiday for a reasonable budget. 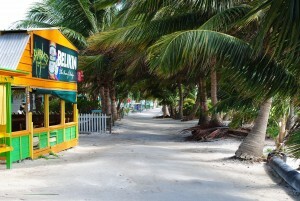 Caye Caulker is small town with just a few streets. The main form of transport is to go on foot, by bike or by golf cart, which can be rented on the island. You can cross the island in less than half an hour by walking. Diving is very good in Caye Caulker and is also a good base for the famous Atolls: the Turneffe Islands and Lighthouse Reef, where you can find the world-famous Great Blue Hole.